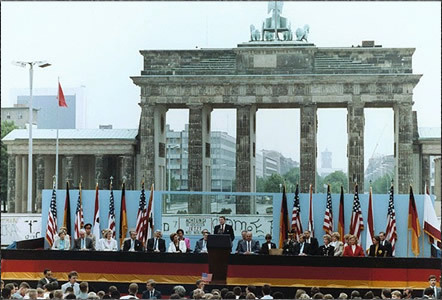 Twenty-four years ago, President John F. Kennedy visited Berlin, speaking to the people of this city and the world at the City Hall. Well, since then two other presidents have come, each in his turn, to Berlin. And today I, myself, make my second visit to your city. Behind me stands a wall that encircles the free sectors of this city, part of a vast system of barriers that divides the entire continent of Europe. From the Baltic, south, those barriers cut across Germany in a gash of barbed wire, concrete, dog runs, and guard towers. Farther south, there may be no visible, no obvious wall. But there remain armed guards and checkpoints all the same—still a restriction on the right to travel, still an instrument to impose upon ordinary men and women the will of a totalitarian state. Yet it is here in Berlin where the wall emerges most clearly; here, cutting across your city, where the news photo and the television screen have imprinted this brutal division of a continent upon the mind of the world. Standing before the Brandenburg Gate, every man is a German, separated from his fellow men. Every man is a Berliner, forced to look upon a scar. In the Reichstag a few moments ago, I saw a display commemorating this 40th anniversary of the Marshall Plan. I was struck by the sign on a burnt-out, gutted structure that was being rebuilt. I understand that Berliners of my own generation can remember seeing signs like it dotted throughout the western sectors of the city. The sign read simply: “The Marshall Plan is helping here to strengthen the free world.” A strong, free world in the West, that dream became real. Japan rose from ruin to become an economic giant. Italy, France, Belgium—virtually every nation in Western Europe saw political and economic rebirth; the European Community was founded. In the 1950s, Khrushchev predicted: “We will bury you.” But in the West today, we see a free world that has achieved a level of prosperity and well-being unprecedented in all human history. In the Communist world, we see failure, technological backwardness, declining standards of health, even want of the most basic kind--too little food. Even today, the Soviet Union still cannot feed itself. After these four decades, then, there stands before the entire world one great and inescapable conclusion: Freedom leads to prosperity. Freedom replaces the ancient hatreds among the nations with comity and peace. Freedom is the victor. As I speak, NATO ministers are meeting in Iceland to review the progress of our proposals for eliminating … weapons. At the talks in Geneva, we have also proposed deep cuts in strategic offensive weapons. And the Western allies have likewise made far-reaching proposals to reduce the danger of conventional war and to place a total ban on chemical weapons. One final proposal, one close to my heart: Sport represents a source of enjoyment and ennoblement, and you may have noted that the Republic of Korea—South Korea—has offered to permit certain events of the 1988 Olympics to take place in the North. International sports competitions of all kinds could take place in both parts of this city. And what better way to demonstrate to the world the openness of this city than to offer in some future year to hold the Olympic games here in Berlin, East and West? In these four decades, as I have said, you Berliners have built a great city. You've done so in spite of threats—the Soviet attempts to impose the East-mark, the blockade.